New research indicates that chemical fingerprints can make positive matches between batches of sarin. 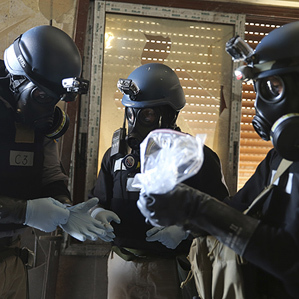 Sarin sleuths: A United Nations expert, wearing a gas mask, holds a plastic bag containing samples from one of the sites of an alleged chemical weapons attack in Damascus. U.S. researchers say the same methods used to confirm the presence of the deadly nerve agent sarin could eventually find matches between different samples of the chemical. Just a few years ago, this wasn’t possible. But research advancing at two U.S. labs is finding that a key ingredient of sarin carries subtle hydrocarbon impurities that vary from sample to sample, forming a telltale and persistent fingerprint. This means that if sarin was used again in a war or terror attack, investigators could determine, say, whether it was from the same batch as the chemical used in Syria or matched evidence found in the home of a suspect. “Once you know it’s sarin—the next question is where did it come from?” says Carlos Fraga, a chemist at Pacific Northwest National Laboratory in Richland, Washington, who coauthored a 2011 paper on the method with colleagues at Battelle Memorial Institute in Columbus, Ohio. “The U.S. government wants to be ready when there might be a chemical attack.” If there is, it could now be possible to figure out who might be responsible. The work isn’t of immediate relevance in attributing the August 21 attack in Syria. The United States says substantial evidence implicates the Syrian regime in the attack, in which the United States says 1,429 people were killed, including 426 children. The source of the impurities being found in sarin isn’t clear, Fraga says; they may have been present in the fossil fuel that served as a manufacturing feedstock, or simply in hydrocarbons that were in the air during manufacturing or processing. But they vary consistently from batch to batch. Fraga’s technique for finding them relies on common methods: gas chromatography and mass spectrometry. The gas chromatograph separates the molecules that make up a complex chemical sample. The mass spectrometer then hits each molecule with electrons, breaking them up into fragments that identify the molecule. This identifies a fingerprint of sarin itself, and also the fingerprint of any hydrocarbon impurities. Similar fingerprinting work is progressing on other chemical weapons and poisons. Ricin, a toxin derived from castor beans that’s considered both a chemical and a biological weapon, has also been found to have distinctive batch-by-batch fingerprints. This is because it is generally extracted using acetone, which contains detectable impurities, Fraga says. Fraga’s work stems from a U.S. Department of Homeland Security project launched after the 2001 anthrax attacks, in which letters containing anthrax spores were mailed to news outlets and the offices of two U.S. senators, killing five people and infecting 17 others.